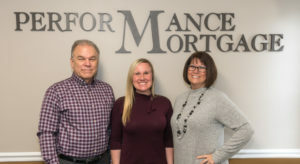 Greenville, OH: Local mortgage broker Performance Mortgage is excited to reveal their new logo and website, coinciding with changes within the ownership team and a renewed go-to-market approach. In late 2018, Performance Mortgage founder Bill Mason stepped down from an ownership role in order to focus on his own personal development. While he remains active within the organization as the Broker and a Mortgage Loan Originator, his departure led the remaining owners, Desteni Mason, John Heath, and Kristina Heath, to re-evaluate their business approach and long-term growth goals. For the past several years, each member of the ownership team achieved a high level of success investing in and growing their own personal brands; Desteni Mason with Mason Knows Mortgages, and John and Kristina Heath with Your Expert Mortgage Team. About Performance Mortgage: Performance Mortgage is a mortgage broker providing home financing services to homebuyers in Ohio, Indiana, Kentucky, and Florida. The company works with over 12 different lenders and specializes in FHA, VA, Conventional, and USDA home loans.